Video is the technology of electronically capturing, recording, processing, storing, transmitting, and reconstructing a sequence of still images which represent scenes in motion. Video technology was first developed for television systems, but has been further developed in many formats to allow for consumer video recording. Video can also be viewed on through the Internet as video clips or streaming media clips on computer monitors. Video is different than film, which captures a moving image as a sequence of still pictures photographically. The term video (from the Latin for "I see") commonly refers to several storage formats for moving pictures: digital video formats, including DVD, QuickTime, and MPEG-4; and analog videotapes, including VHS and Betamax. Video can be recorded and transmitted in various physical media: in magnetic tape when recorded as PAL or NTSC electric signals by video cameras, or in MPEG-4 or DV digital media when recorded by digital cameras. In the UK, Australia, and New Zealand, the term video is often used informally to refer to both video recorders and video cassettes; the meaning is normally clear from the context. Frame rate, the number of still pictures per unit of time of video, ranges from six or eight frames per second (fps) for old mechanical cameras to 120 or more frames per second for new professional cameras. PAL (Europe, Asia, Australia, etc.) and SECAM (France, Russia, parts of Africa etc.) standards specify 25 fps, while NTSC (USA, Canada, Japan, etc.) specifies 29.97 fps. Film is shot at the slower frame rate of 24fps, which complicates slightly the process of transferring a cinematic motion picture to video. To achieve the illusion of a moving image, the minimum frame rate is about ten frames per second. Video can be interlaced or progressive. Interlacing was invented as a way to achieve good visual quality within the limitations of a narrow bandwidth. The horizontal scan lines of each interlaced frame are numbered consecutively and partitioned into two fields: the odd field consisting of the odd-numbered lines and the even field consisting of the even-numbered lines. 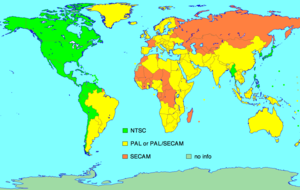 NTSC, PAL and SECAM are interlaced formats. Abbreviated video resolution specifications often include an i to indicate interlacing. For example, PAL video format is often specified as 576i50, where 576 indicates the vertical line resolution, i indicates interlacing, and 50 indicates 50 fields (half-frames) per second. In progressive scan systems, each refresh period updates all of the scan lines. The result is a higher perceived resolution and a lack of various artifacts that can make parts of a stationary picture appear to be moving or flashing. A procedure known as deinterlacing can be used for converting an interlaced stream, such as analog, DVD, or satellite, to be processed by progressive scan devices, such as TFT TV-sets, projectors, and plasma panels. Deinterlacing cannot, however, produce a video quality that is equivalent to true progressive scan source material. The size of a video image is measured in pixels for digital video or horizontal scan lines for analog video. Standard-definition television ( SDTV) is specified as 720/704/640×480i60 for NTSC and 768/720×576i50 for PAL or SECAM resolution. New high-definition televisions ( HDTV) are capable of resolutions up to 1920×1080p60, i.e. 1920 pixels per scan line by 1080 scan lines, progressive, at 60 frames per second. Video resolution for 3D-video is measured in voxels (volume picture element, representing a value in three dimensional space). For example 512×512×512 voxels resolution, now used for simple 3D-video, can be displayed even on some PDAs. Comparison of common cinematography and traditional television (green) aspect ratios. Aspect ratio describes the dimensions of video screens and video picture elements. The screen aspect ratio of a traditional television screen is 4:3, or 1.33:1. High definition televisions use an aspect ratio of 16:9, or about 1.78:1. The aspect ratio of a full 35 mm film frame with soundtrack (also known as "Academy standard") is around 1.37:1. Pixels on computer monitors are usually square, but pixels used in digital video often have non-square aspect ratios, such as those used in the PAL and NTSC variants of the CCIR 601 digital video standard, and the corresponding anamorphic widescreen formats. Therefore, an NTSC DV image which is 720 pixels by 480 pixels is displayed with the aspect ratio of 4:3 (which is the traditional television standard) if the pixels are thin and displayed with the aspect ratio and 16:9 (which is the anamorphic widescreen format) if the pixels are fat. Colour model name describes the video colour representation. YIQ is used in NTSC television. It corresponds closely to the YUV scheme used in PAL television and the YDbDr scheme used by SECAM television. The number of distinct colours that can be represented by a pixel depends on the number of bits per pixel (bpp). A common way to reduce the number of bits per pixel in digital video is by chroma subsampling (e.g. 4:4:4, 4:2:2, 4:2:0). A wide variety of methods are used to compress video streams. Video data contains spatial and temporal redundancy, making uncompressed video streams extremely inefficient. Broadly speaking, spatial redundancy is reduced by registering differences between parts of a single frame; this task is known as intraframe compression and is closely related to image compression. Likewise, temporal redundancy can be reduced by registering differences between frames; this task is known as interframe compression, including motion compensation and other techniques. The most common modern standards are MPEG-2, used for DVD and satellite television, and MPEG-4, used for home video. Bit rate is a measure of the rate of information content in a video stream. It is quantified using the bit per second (bit/s) unit or Megabits per second (Mbit/s). A higher bit rate allows better video quality. For example VideoCD, with a bit rate of about 1 Mbit/s, is lower quality than DVD, with a bit rate of about 5 Mbit/s. HDTV has a still higher quality, with a bit rate of about 20 Mbit/s. Variable bit rate (VBR) is a strategy to maximize the visual video quality and minimize the bit rate. On fast motion scenes, a variable bit rate uses more bits than it does on slow motion scenes of similar duration yet achieves a consistent visual quality. For real-time and non-buffered video streaming when the available bandwidth is fixed, e.g. in videoconferencing delivered on channels of fixed bandwidth, a constant bit rate (CBR) must be used. Stereoscopic video requires either two channels — a right channel for the right eye and a left channel for the left eye or two overlayed colour coded layers. This left and right layer technique is occasionally used for network broadcast, or recent "anaglyph" releases of 3D movies on DVD. Simple Red/Cyan plastic glasses provide the means to view the images discretely to form a stereoscopic view of the content. New HD DVD and HD Blu-ray disks will greatly improve the 3D effect, in colour coded stereo programs. The first commercially available HD players are expected to debut at the 2006 NAB Show in Las Vegas in April. See articles Stereoscopy and 3-D film. HDMI (uncompressed video & audio). HDCP mandatory.